Frank Steunenberg | Nobody Move! 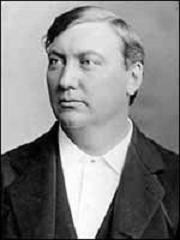 On this date in 1905, former Idaho Governor Frank Steunenberg was killed by a bomb that was rigged to a gate at his home. While in office, Steunenberg took a tough stand against the Western Federation of Miners during a period of labor unrest. Former WFM member Albert Horsley (a/k/a Harry Orchard) was arrested for the crime. Legendary Pinkerton detective James McParland headed up the investigation. McParland pressured Horsley into implicating three high-ranking WFM officials as co-conspirators. Horsley was ultimately convicted of Steunenberg’s murder, but his testimony against the other men was discredited. Two of them were acquitted at trial, and charges were dropped against the third. Albert Horsley was sentenced to death by the court, but the sentence was later commuted to life in prison. He died in prison in 1954 at the age of 87.